Since 2015, when the United Nations established a set of shared goals and targets for achieving sustainable development around the world, the development community has been excited, energized but also a little bit wary. While the ambition contained within the Global Goals is high, the challenge is vast. What is more, we face a moving target. In particular, the Fourth Industrial Revolution, driven by rapid technological advances, has the potential to change everything and, while there will undoubtedly be new growth, benefits and new opportunities, the impact on the world’s poorest could be disastrous. The already demanding targets we have set for ourselves will become even harder to achieve. We do not yet know just how things will unfold, but one thing is for sure: the scale, scope and complexity of the economic and social transformation to come will be such that no one sector – government, business, civil society or academia – will be able to manage the transformation alone. We’re going to need some surprising alliances that bring different sectors together if we are to overcome its challenges. Civil society organisations, with their capacity for increasing accountability and promoting participation, can play a critical partnership role with both governments and businesses. By sharing information, resources, activities, and capabilities we can achieve things together that we could never achieve alone. At Plan International, we’re already busy convening strategic partnerships with businesses like Accenture, and a particular priority for us now is to improve the position of girls within the poorest countries. There is a direct motivation for businesses to get involved. Studies have shown that investing in girls and gender equality can have a direct impact on economic growth. For example, the World Bank found that investing in girls to close the education gap with boys would lead to lifetime earnings increases equivalent to an increase in annual GDP growth rates of about 1.5%. This kind of cross-sector partnership is essential to achieving the scale and sustained impact we need to see. These partnerships can unleash innovative ways of working, mobilizing expertise and hard to reach resources, and create shared accountability in an increasingly complex world. There is a real opportunity to develop new approaches to partnering that go beyond philanthropy, towards generating shared value. Each sector has a valuable role to play, but it is in collaboration that real transformation comes. Building partnership models which are long lasting, scalable and transformative, and which create shared value will be key. The rapid transformation heralded by the Fourth Industrial Revolution will affect economic, social, environmental, cultural and political life more widely, demanding new ways of working together. Already, traditional boundaries between the sectors have become blurred, with a less direct role for governments and a wider governance role for business and civil society. In the context of global instability and economic transformation, there are new opportunities and new responsibilities for each sector and, increasingly, a shared set of interests in achieving the kind of world envisaged in the UN’s Global Goals, not least in Sustainable Development Goal 17 which is about creating partnerships for the Goals. At Plan International, we are already working closely with Accenture and others to lay foundations for transformative social and economic change. Developing countries face massive challenges with youth unemployment, and as many as two-thirds of the youth population aged 15 to 24 are unemployed or in irregular employment . The impact of global economic change is likely to exacerbate the problem, and the high unemployment rate among young people can be a potential source of social unrest and political instability. 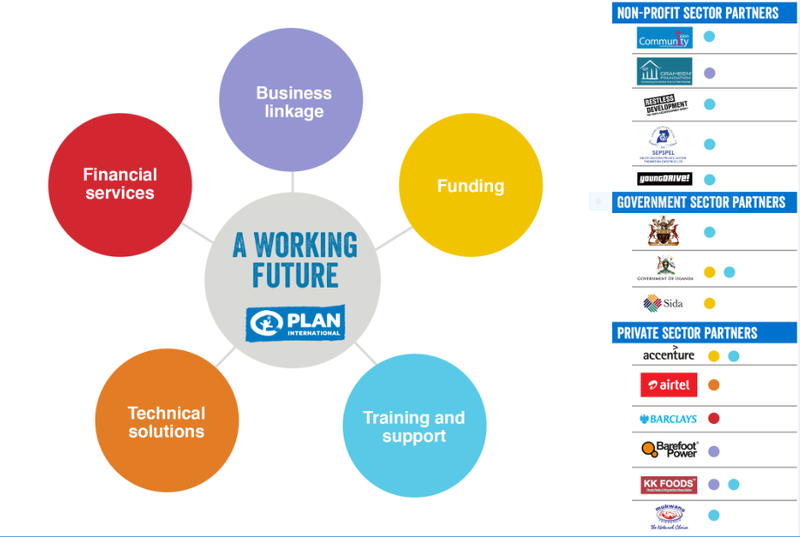 Plan International understands that it is also an opportunity. If nations and institutions can harness the tremendous power and resourcefulness of young people, they can be part of the solution to one of the world’s most pressing problems. For example, in Uganda A Working Future initiative was co-created by Accenture Development Partnerships and Plan International to support youth economic empowerment through innovative collaboration across all sectors. Our work together is part of the company’s flagship corporate citizenship initiative, ‘Skills to Succeed,’ which advances employment and entrepreneurship opportunities for individuals around the globe, leveraging technology to drive impact at scale. With funding and technical support from the Swedish International Development Cooperation Agency, a wide ranging partnership – including a number of local businesses – has been formed to change the lives of young people in rural Eastern Uganda by providing them access to financial services, teaching them critical skills, and linking them to work opportunities. The private sector has been invaluable at every stage, from the design of the programme to the delivery of training. Combined with Plan International’s grass roots reach and access, rights based approach, trusted community level relationships, technical expertise and local networks, as well as other partners’ contributions, the outcomes have been phenomenal and already over 12,000 young people have benefitted from the programme. The participating youth have seen a 621% increase in average monthly income and a 631% increase in savings. Working with companies like Accenture, we’re now scaling-up the model to bring skills and jobs to 100,000 young people in four African countries: Uganda, Zambia, Tanzania and Egypt. 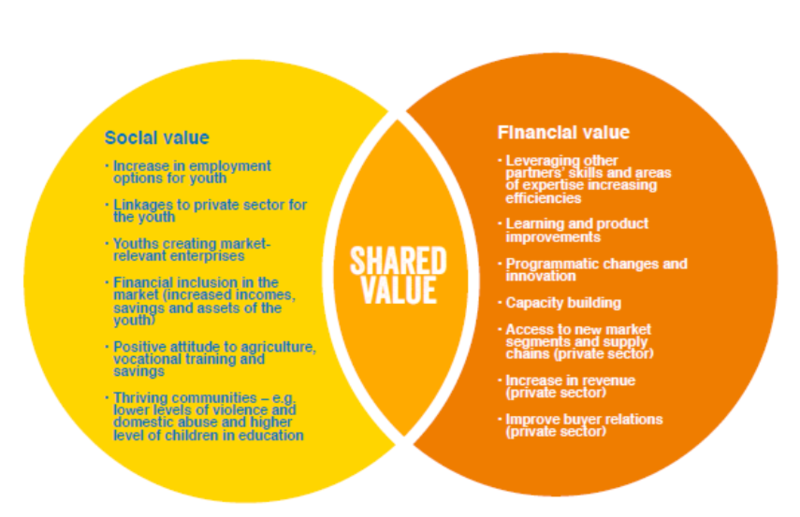 The success has been due to the collaborative partnership mode, which brings together a mix of strategic partners from different sectors both at the global and local level, but also retains the agility to adapt to the local context, and to find a way of working that creates true sustainable change and impact, and value for all. Collaboration – working together – was one of the core objectives of A Working Future from the start, much more than simply benefiting from the each other’s resources and capabilities. The initiative is a model for the kind of partnerships I believe will be increasingly important in coming years. As the boundaries between sectors become blurred, the interdependencies become more pronounced yet the complexities increase, the sectors need to become better able to find common ground. Different sectors should be open minded about working together, not afraid to take risks to collaborate in new ways, and to ensure the lessons of these partnership models – good and bad – are shared widely. As we’ve seen in our partnership with Accenture, we learn more about each other over time. We find new opportunities to work together and to create new solutions. As 3,000 global leaders met last week in Davos to reflect on how together we can create responsive and responsible leadership in a changing world, we were able to share some of these new models of partnership we have been pioneering. We shared our insights on the changing dynamics between the sectors, and showed how we can work together to transform the lives of 100 million girls, our new ambition. The times are uncertain, the challenges huge, but the task is one that we cannot afford to duck.